Enjoy a relaxing day in Chuncheon City - capital of Gangwon Province in South Korea. Will take about one and a half hour from three spots of Seoul city center to Chuncheon City. After arriving there, will visit total three attractions - Jade Garden, Alpaca World and Gubongsan cafe street. The whole trip will take around 11 to 12 hours. 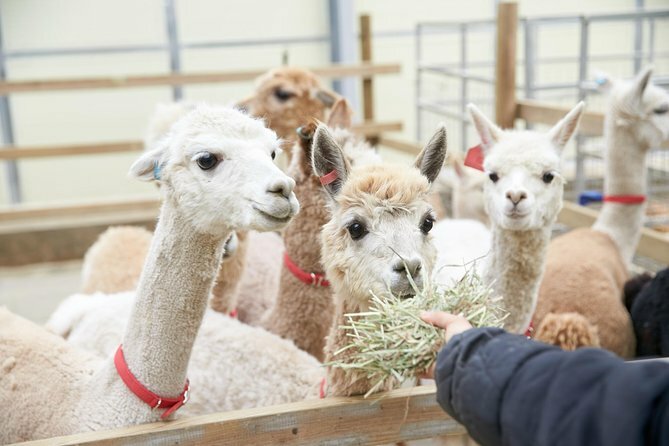 Alpaca World is the one and only in Korea where you can see, feed and touch alpacas, white deers, mules, hinnies and ponies. Moreover, you can join and experience different kinds of activities there as well, such as animal parade that you can experience seasonally-themed parade of those animals Eco electric cart where you can sit back in the cart to enjoy the fairy-tale scene and smelling fresh air, as well as experience the hourse-riding, hug and feed rabbits and so on. Gubongsan Mountain Observatory is one of the most scenic driving courses in Chuncheon, stunning with its breathtaking views both day and night. With fresh brewed coffee in hand, go for a stroll to its outside terrace or garden where you can gaze out on the beauty of Chuncheon. Jade Garden, created under the theme of "Small Europe in the Forest," is located near Jade Palace Golf Club.The 24 distinctively-themed areas in the garden boast a total of 3,000 plant species including rhododendrons, maple trees, irises, and blueberry bushes as well as patches of thick, natural forests. 7:20pm Arrive at Hongik Univ. Station.